There’s this restaurant in New York’s Lower East Side called Congee Village that I sometime’s frequent for delicious bowls of Chinese congee with all the fixings as well as an order of their special “Bean Curd with Soy Sauce” dish. That dish (in addition to it being named just that) is as simple as it sounds—a bit of silken soft tofu and some soy sauce, and yet it has got to be one of my favorite restaurant dishes of the city. Keeps me coming back. I had planned to make a visit there this past weekend but instead serendipidously made a last minute trip to Boston, thus leaving my tofu craving unfullfilled. Cue Sunday night dinner and this dish was born, featuring ultra soft lightly pan-seared silken tofu in a bed of scallion and garlic soy sauce. I can’t say this recipe is an exact replica, but I can say that it is simple and oh-so delicious! I rarely work with soft silken tofu for cooking. Unlike the typical firm and extra firm tofu styles reserved for stir-frys and crispy crusts, the silken variety is increadibly soft and fragile (as one might expect), which makes it difficult for cooking. It’s delicate creaminess makes it a great candidate for dairy substitutes in desserts like smoothies, but it’s that same creaminess that makes it so tasty in this dish if it actually stays together! I did my best to exercise great care in handling the delicate tofu slices and reaped the rewards in the end! 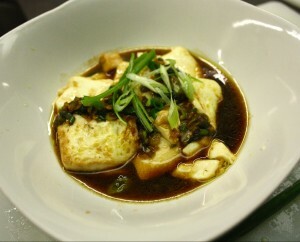 A simple Chinese-style dish featuring pan-seared silken tofu served with a garlic scallion soy sauce. Light, creamy, and savory. Drain silken tofu package of excess water and remove from packaging with care and caution (especially with the soft variety as it has a tendancy to fall apart easily). Slice into 1-cm thick "patties"---I first made 1-cm slices width-wise, then another slice to halve them length-wise. Lay individual tofu squares on a cutting board, slightly propped up to drain excess water. Sprinkle salt on each side of the tofu squares, again exercising care when flipping sides, and let sit for ~10 minutes. Even more water will be drained during this wait time. While waiting for tofu, combine garlic, scallions, soy sauce, metsuyu, sesame oil, water (and other optional add ins) in a small bowl and let sit to marinate. Heat a large skillet on medium with olive oil (and optionally a few drops of soy sauce for a browning color effect). When heated, carefully place tofu patties in oil. Place them as close to the surface of the pan as possible so as to minimize droppage and breakage. Reduce heat to med-low. Sear one side for about 6 minutes until a slight brown, then flip and sear the other side for the same amount of time. 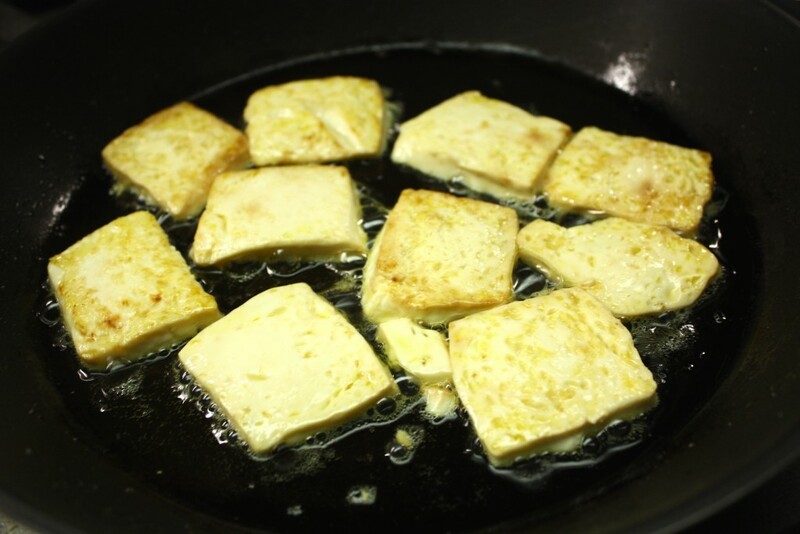 Place pan-seared tofu on a plate or bowl and carefully dab with a paper towl to remove excess water and oil. Using the same skillet, heat scallion soy sauce over med-low heat until slightly simmering. Pour the heated scallion soy sauce over the prepared tofu. Add a sprinkle of red pepper flakes, sesame seeds, or freshly julienned scallions for garnish. Serve immediately and enjoy while hot! Optional ingredient additions for the soy sauce mixture include chopped red onion, red chili flakes, hot chili paste/oil, white pepper, etc. What favorite restaurant dishes have you tried replicating and home? Happy cooking and thanks for stopping by… I’d love to hear from you so please leave your thoughts and comments below!